This multi-directional LPG or Diesel powered forklift is the ideal solution for handling long and awkward loads in confined spaces. 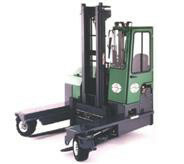 Essentially three machines in one, it operates as a counterbalance forklift, sideloader and narrow aisle truck both indoors and out in all weather conditions. 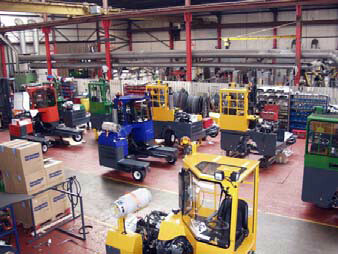 Can operate in aisles as narrow as two metres. Four way steering and travel for exceptional mano­euv­ra­bility. Wide range of optional extras for maximum flexibility. Creates vast increases in storage space utilisation. Capacities from 2,500Kg to 14,000Kg. 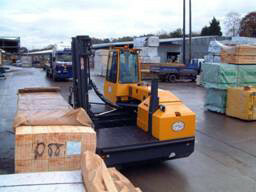 The innovative design of Combi Lift trucks is proving to be invaluable to customers who have limited warehousing space. Until you've seen a Combi in action you have no idea just what manouverability is. 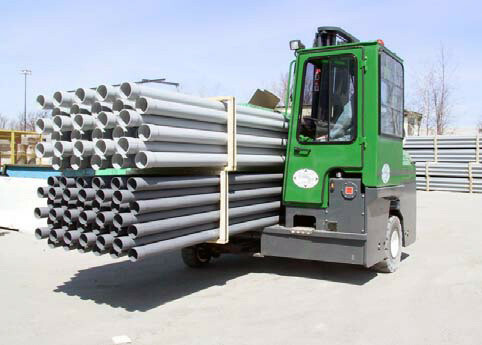 The Combi Lift series is ideally suited for the movement of the awkward long loads, where turning with the load is not desirable. It's also just at home out in the yard where many other trucks would be out of their depth. The truth of the matter is that the Combi Range of trucks just have to be seen to be believed, so if you would like to be truly amazed at their performance, contact us for further information.